“So it is ourselves that we must spread under Christ’s feet, not coats or lifeless branches or shoots of trees, matter which wastes away and delights the eye only for a few brief hours. Today, April 1, was joyful in Rome, with the sun breaking through a grey sky at mid-morning, just after the 84-year-old Pope finished his homily. Though St. Peter’s Square was filled with some 200,000 faithful from around the world to commemorate the entrance of Jesus into Jerusalem, and the beginning of the week which recalls his suffering, death and resurrection, there was profound silence and reverence during a liturgy celebrated largely in Latin. The Pope, who will turn 85 on April 16, and on April 19 will celebrate the end of his 7th year as Pope, seemed serene, and strong, despite just having returned from a grueling, 6-day trip to Mexico and Cuba (March 23-28). He chanted long parts of the liturgy himself, in Latin, in a clear voice, without any hesitation, enunciating each syllable perfectly. I was privileged to be only a few yards away from him, and could see and hear him clearly. His homily, which he read in Italian, touched on the fundamental question of Jesus’s mission: What kind of Messiah was Jesus? “He whom the crowd acclaims as the blessed one is also he in whom the whole of humanity will be blessed,” Benedict said. It is worth reading this homily, then, with some care, because in this homily we can catch a glimpse of Benedict’s understanding, not only of Christ and his mission, but also of the nature of the Promise made to the People of Israel, and of the way that Promise began to be fulfilled in Christ, and will be completely fulfilled at the end of “this age,” when all shall be changed, and the definitive reign of God will be present, and no longer hidden. In this sense, clearly, Benedict’s call for greater freedom for the Cuban people, freedom of religion but also freedom in general, was heard by the Cuban regime, and so the trip has already brought forth significant fruit. This allows hopes that more fruits may yet come from the Pope’s historic visit. After Pope John Paul II’s historic 1998 visit to Cuba, the authorities agreed to make Christmas a holiday. 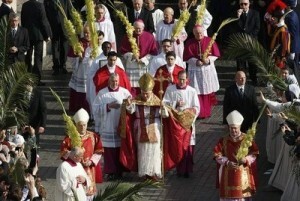 Cuba said Saturday a decision on whether to make Good Friday a similarly permanent holiday would be made later.